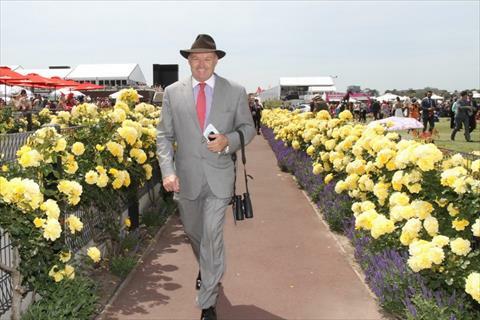 David Hayes is the proprietor and head trainer at Lindsay Park Racing Stables. By the time David was born in 1962, his father Colin was already firmly entrenched as the leading trainer in South Australia (having won six of the previous seven Metropolitan Trainers Premierships) from his stables at 'Surefoot Lodge' in Semaphore (Adelaide). David grew up surrounded by horses, and when he was young, Colin moved the family (and his training operation) to a new property 80km north of Adelaide near Angaston in the Barossa Valley. This property was to be known as Lindsay Park, which became an iconic horse property, known all over the world. From a young age, David followed his dad around constantly in the stables and at the track, observing and learning from him as much as he could. When he was old enough, he served a thorough apprenticeship by helping out in the stables where he experienced every aspect of the business. He spent time with the vets, and farriers, and he rode trackwork, strapped horses and mucked out stables. After a brief flirtation with a professional sporting career (David was a State Champion Triple-jumper and placed third at the National titles. He also played in a premiership with Central Districts under-19s side in the South Australian National Football League. David joined the business full-time and began working side by side as an Assistant Trainer with his father from the age of 21. David took over the training operation at Lindsay Park at the start of the 1990-91 season at the age of 28, following his fathers retirement. During this first season, David won the Cox Plate (Australia’s G1 weight-for-age championship) with Better Loosen Up, set a world record of six Group winners in a day at Flemington on Derby Day and then won the Gr 1 Japan Cup (the world’s richest race at the time) with Better Loosen Up a month later. In 1994, he won the Melbourne Cup with imported galloper Jeune (for Sheikh Hamdan bin Rashid al Maktoum) and by the end of the 1994-95 season, David had won every Melbourne and Adelaide Metropolitan Trainer’s Premiership and racked up an amazing 31 Group One wins. In 1996, David accepted an invitation to train in the world’s toughest racing environment, Hong Kong. He was an immediate success, winning two Trainer’s Premierships (in the top four in each of his nine seasons) and training 458 winners including the G1 Hong Kong International Sprint (All Thrills Too in 2002) and the G1 Hong Kong Derby (Elegant Fashion in 2003) and 15 other Hong Kong Group Ones. David returned to Lindsay Park in 2005 and has since secured another two Melbourne Metropolitan Trainer Premierships, three Adelaide Metropolitan Premierships and trained a further 40 Group One winners. In his 28 year training career, David has trained in excess of 4000 winners, including 91 Group One wins. He has won most of Australia’s major races including the Melbourne Cup (Jeune in 1994), Caulfield Cup (Fraar in 1993 and Tawqeet in 2006, Boom Time, 2017), Cox Plate (Better Loosen Up 1990 and Fields of Omagh in 2006) and the Golden Slipper (Miss Finland in 2006), Queen Elizabeth Stakes (Criterion in 2015), Australian Cup (Spillway in 2015, Harlem in 2018). David is the youngest trainer ever to be inducted when he joined his father Colin in the Australian Racing Hall of Fame in 2008. David is married to Prue and has four children, Ben, in the training partnership, J.D. and William who ride track work for Lindsay Park while studying and playing AFL and Sophie working in digital marketing.